The Cumberland & Dumfriesshire Farmers Mart P.L.C. had forward 56 prime cattle, 2 young bulls, 23 over thirty month cattle, 5,074 prime lambs and 5,096 cast ewes & rams at their weekly sale at Longtown on Thursday 19th August, 2010. A larger show of prime cattle was on offer and were met by keen bidding which saw cattle dearer on the week. Limousin bullocks sold to a top of 179.5p from A. & W.J. Taylor & son, Dashwellgreen and purchased by W. Kirkup & Sons, Butchers, Longtown, others 174.5p from J. & N. Blaylock & Son, Hallburn to Messrs Nattrass, Butchers, Carlisle, 173.5p, 167.5p Dashwellgreen, 167.5p, 165.5p Hallburn, 163.5p Dashwellgreen; Charolais 148.5p Sceughdyke. Heifers to 163.5p Newby Farm, 157.5p Sceughdyke; Charolais 161.5p Spoutbank, 149.5p Upper Mains, 147.5p Sceughdyke; Galloway 158.5p Hallburn. Top per head of £1,158.30 for a Charolais bullock from Sceughdyke; Limousin £1,160.43 Hallburn, £1,148.80, £1,130.63 Dashwellgreen, £1,113.88 Hallburn; Galloway £1,006.48 Hallburn. Charolais heifers £926.90, £918.40 Upper Mains; Limousin £850.50 Sceughdyke. Young bulls sold to 117.5p and 115.5p for Friesians from Harelawhole. OTMS met a brisk trade and sold to 122.5p (£1,323) for a Limousin cast bull from J. & J. & D. Taylor, Englishtown. Cows to 101.5p for a Limousin from Bleatarn, 93.5p Kilnhill, 89.5p Gallowberry; Hereford 93.5p Smallholms; Frisian 93.5p Scugg House, 79.5p Grainhead; Galloway 81.5p Milnholm. A larger quality show of 5,074 prime lambs was forward. Trade was above earlier weeks prices to average 163p overall. Top per kilo of 213.2p and £93.80 per head for Texels from D. & R. Cornthwaite, Balgray Hill, Lockerbie, other Texels £90.80 Kirkton, £90 Chapel House; Suffolk £85.80 Lyneholm, £84 North House, £83.20 Lyneholm; Beltex £80 Waterside; Greyface £72.80 The Nook, £68.80 Whintingstown, £67.20 East Unthank; Cheviot £67.20 Potholm, £66 Hownam Grange, £65.20 Adderston Shiels; Half Bred £67.20, £66.20 Adderston Shiels, £65 Earlside; Blackface £63.80 Milnmark and Allensgreen, £62.20 Crowhall. More lightweight lambs were on offer and were again very dear to average 172.55p. Top price of 238.6p per kilo and £66.80 per head for Texels from Byers Farm, others £62.80 Newington; Suffolk £60.80 Murtholm; Greyface £58.80 Arnicle, £56.40 Williamston; Blackface £58.20 Balgray Hill, £57.80 Arnicle, £56.20 Crawfordjohn Mill; Charollais £56.80 Maidencoates; North Country Cheviot £55.80 Whitefield; Swaledale £46.80 Howburn. A smaller entry of 5,086 cast ewes and rams attracted the usual buyers, trade was very strong throughout. Top price of £155 for a Suffolk ram from North House; Texel £141 Stackbraes, £130 Pool Farm; Oxford £113 Guards; North Country Cheviot £101 Newbigging; Lleyn £99 Stackbraes; Charollais £95 Townfoot; Leicester £89.50 West Hottbank; Beltex £87 Eastside; Blackface £86 Cleughfoot; Hill Cheviot £79 Cosyden; Zwartbles £75 Stackbraes. 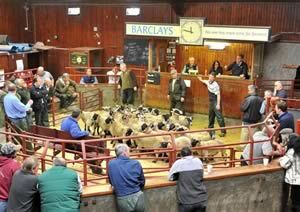 Heavy ewes to £130.50 for Suffolks from Kilnford Croft, others £127 Stackbraes; Texel £126 Balgray Hill. £117 Lydden; Charollais £115.50 Mossband Hall, £103 Severs; Leicester £115 Allensgreen; Milk Sheep £113 Middle Farm; North Country Cheviot £101 Clatequoy and Mid Calder; Beltex £93.50 Bluebell; Oxford £89 Guards; Zwartbles £83 Winterhope; Greyface £83 Pool Farm, £79.50 Church Road, £78.50 Newbigging; Cheviot Mule £81.50 Outertown, £81 Stackbraes. Hill ewes to £71 for Cheviots from Winterhope, £70.50 Byreburnside, £67.50 Binks, £67.50 Catslackburn; Lleyn £71 Severs, £65 Lustruther, £63 Golden Lane; Blackface £63.50 West Hottbank, £63, £60.50 Cleughbrae; Swaledale £59.50 Waterloo, £56.50 Woodhall, £55.50 Stackbraes; Shetland £53 Sockbridge Hall. Goats to £61 from Roadside.